Online courses are amazing for learning and improving your skills. While you can learn a lot from podcasts and blog posts, sometimes you just need a course to see it in action in order to really master a new skill. And right now (Nov. 14 – Nov. 25), Udemy is running a ridiculously awesome deal where they are giving away all their courses for just $9.99. But there are over 80,000 courses to choose from, it could take forever to find which ones are relevant and worthwhile. So I did the hard work for you and outlined 50 of the top courses specifically for self-publishing authors and writers. Many of these courses are normally $100 or more, but for this week only, ALL UDEMY COURSES ARE UP TO 90% OFF! This deal expires Sunday, November 25th, so don’t wait. Take advantage of this deal while it lasts. Without further ado, let’s head to class. Note: The (*) that is in the title of some of the courses denotes that this course is listed as a Udemy Bestseller. Also, I just want to be upfront that the Udemy links in this post are affiliate links, which allow me to keep writing and publishing free content to help you be a more successful author. First up are courses directly related to writing. Below are the top courses with tons of social proof that previous students were happy with the course content and value. Want to learn directly from your writing heroes, like James Patterson, Judy Blume, and Malcolm Gladwell? Learn how in my MasterClass review. Check It Out On Udemy! 30 creative writing exercises & different writing prompts to spark your creativity for fresh poetry and story ideas. You will be writing page-turning fiction that your readers will love when you plot, outline and write the right way. Outline best selling fiction books. Improve any story by adding more tension and excitement. Write quicker and easier with an outline as your guide. Analyze great stories and use them to inspire your own amazing stories. Ex-Wall Street Journal Editor Reveals How To Make Your Blogs, Books & Business Writing Sparkle. Unlock your creative writing ability. Turn Your Business Writing, Blogs, Books & Essays Into Masterpieces. Writing novels, blogs, or nonfiction books? Learn editing techniques in this writing course and up your writing skills. add snazz and pizzazz to the fiction you write by using figures of speech! choose the strongest POV for the novel you’re writing. spiffy up your novel with solid editing tips, before you submit it to agents and editors. write your novels and creative nonfiction books with an engaging voice. Master dialogue mechanics, attribution and beats, and start writing like a pro. Discover how to take something that is funny, and stretch it to make it a lot funnier. Understand how when you write or present humorous material, subtle things like word choice, word order, and pacing can make a profound difference in whether or not something is funny. Everything you need to know to get your Children’s Book finished and off to a great publisher. These awesome courses either give a broad overview of how to self-publish ebooks or they focus on one specific component, such as formatting. *This course is led by Nick Loper, the authority blogger of Side Hustle Nation and The Side Hustle Show podcast. He creates super awesome stuff. Learn how to make money writing with this complete guide to writing, formatting, publishing, and marketing Kindle ebooks. Learn how to start your own business successfully selling Kindle eBooks with very little writing involved. Learn How To Start A Kindle Direct Publishing Business Without Writing The Book Yourself! Publish their Kindle book on Amazon Kindle. Know how to outsource and get an expert to write their first book for them. Research and find a profitable niche for the Kindle book. Self-Publishing? Create your own professional looking book covers; ready to upload to major retailers and distributors. Know the current specifications for print book, eBook and catalog covers on major platforms like Amazon and Smashwords. Use the GIMP to create 3D book covers and other advanced techniques using this free image manipulation program. Book Cover Design with Microsoft PowerPoint 2013 explains how to simply and easily create professional book covers. Learn how to wrap your awesome content in an eye ball-grabbing package, sprinkle it with your personality and sell it with love! The courses in this section can help you with different aspects of being an author and marketing yourself and your books online. These courses relate to different aspects of building your author brand and business online. Things like starting a website using WordPress and improving your copywriting skills may not seem completely relevant to writing books at first, but they are definitely skills you can use to leverage your author platform online. Discover the secrets of copywriting success from the master. From novice to pro in easy stages. In 2017, build a beautiful responsive WordPress site that looks great on all devices. No experience required. By the end of this course, you will be able to set up your own self-hosted WordPress website the right way! STEP TWO: Buy the right hosting for your needs. STEP THREE: Get everything pointing to the right places. Learn powerful business writing skills from a University of Cambridge writing tutor. 50+ advanced writing techniques for creating engaging content, building trust with the audience and winning the sale. In this course ,you will learn the foundations of how to get quality sleep. This course will cover all the principal components of how to tailor your lifestyle to achieve optimal sleep. How you can get Scrivener to do exactly what you want and accelerate your writing career in less than 1 week. Dramatically improve your writing productivity in as little as days or weeks! The Psychology of Writing Confidently, Writing Successfully, Writing Happily & Curing Your Self-Defeating Perfectionism. Whether you want to improve your writing, marketing, self-publishing, author business, or productivity as a writer, there’s a valuable course for everyone on this list…for cheap! Ten bucks and a little time is a small investment that could give you massive results as an author, self-publisher, and entrepreneur. Even if you don’t have the time to take an entire course this week, buy the courses now before this deal ends. You can take them later when you have more time. I know there was a course (or five) that peaked your interest too. Get these courses now while they’re just $9.99 because after Sunday, November 25th you’ll have to pay 90% more. Crikey! So, which courses will you dive into? 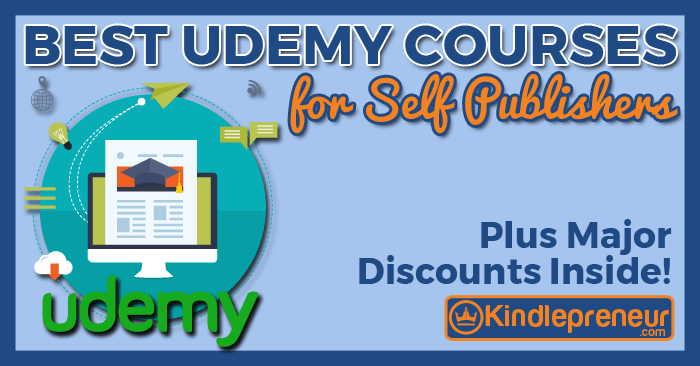 Are there any other self-publishing Udemy courses you loved and would add to the list? P.S. Curious what our requirements were for making the list? First, we made sure each course had at least 30 stellar reviews, and the average rating was 4 stars or higher. Note: This information is accurate at the time of writing but may change over time. We will do our best to keep this list updated. If you notice something out of date, please send me a polite email letting me know and I’ll get it fixed asap. I’m confident if you’re a self-publishing author, you will find something on this list that could help you sell more books. But remember, this special $9.99 deal is only good until Sunday, November 25th.